Los Angeles, CA – August 7, 2018: Individuals can pay as much as 143 percent more for virtually identical Medicare Supplement insurance protection according to a cost analysis by the American Association for Medicare Supplement Insurance. “While Medicare Supplement insurance policies are basically standardized, each insurer sets their own rates and the difference between the lowest and highest cost can be significant,” explains Jesse Slome, director of the Association. The organization compared rates for both men and women age 65 who live in 15 of the latest U.S. markets. The largest difference between the lowest available cost and the highest could be found in Manhattan (New York City). “The difference was 143.3 percent,” Slome shares. The smallest difference was 12.9 percent for a 65-year old woman purchasing coverage in Jacksonville, Florida. 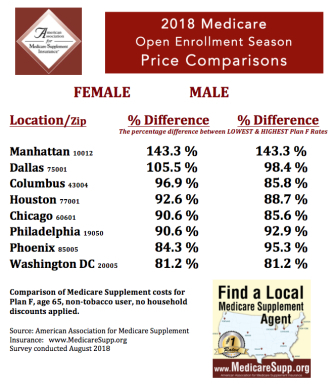 Click this link to see the listing of top-15 cities and the percentage difference between the lowest cost and the highest cost for a 65-year old Plan F Medigap policy. The organization provides free access to the leading national Find A Local Medicare Insurance Agent online directory providing information on nearly 1,000 professionals listed by Zip Code. No information need be entered to access the director at the Association’s website, www.MedicareSupp.org/find-local-agents/. 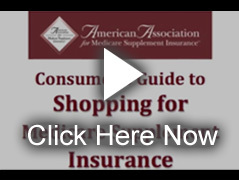 The American Association for Medicare Supplement Insurance advocates for the importance of planning and supports insurance professionals who market Medicare-related insurance products. The organization’s website contains relevant research and information designed to help consumers make educated choices in their planning.